He and his entire cabinet are not equal to the occasion, and are full of incapacity and rottenness. 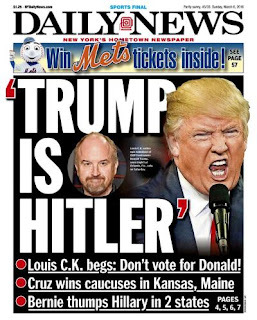 Notably absent from the above are these: “He’s Hitler, a Nazi, a Fascist". That’s because those words were not available in the 1860s. You see, those were all words said verbatim by Democrats about Abraham Lincoln, not just Donald Trump! That's not to imply some equivalence between Donald Trump and the now revered Honest Abe. It is, however, to imply that there are some striking similarities between what's happening with Trump and what happened with Lincoln. In many significant and ominous ways we are reliving the disastrous 1860s. That should concern everyone. Here's the thing: Democrats hated Abraham Lincoln for the same reason they hate Donald Trump; it all comes down to entitlements. Entitlements are anything that benefits one group of people at the expense of another. Slavery, aside from the racial, abuse, and imprisoning aspect, was all about benefiting one group at the expense of another. Today’s Democrats have several entitlements perceived to be under threat by Donald Trump: the teacher's union monopoly entitlement, the government bureaucrat power entitlement, the various Obamacare entitlements, the government union job entitlement, the cheap labor illegal immigrant entitlement, the Muslim refugee entitlement, the illegal voting entitlement, the congressional unlimited tax and spend entitlement, the subsidized mortgage entitlement, the media power entitlement, the lopsided trade agreement entitlement, the EPA unlimited power entitlement, the radical LGBTQ federal rights entitlement, the federally funded late term abortion entitlement, and many more. And that list doesn’t include the traditional redistribution entitlements like Social Security, Medicare, Medicaid, Food Stamps, etc. Even Donald Trump’s just released budget doesn’t dare touch those entrenched goodies. But it matters little whether or not a politician explicitly threatens to take the candy away. The only requirement for drawing Democrat vitriol is the perception that an entitlement is under threat. Thus, pretty much every Republican since the Progressive Era has been Hitler or equivalent. 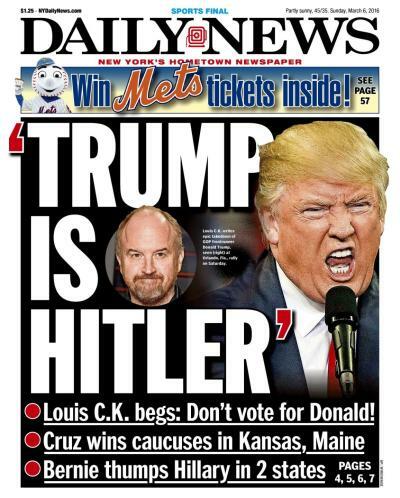 Most recently, Reagan was Hitler, Bush was Hitler, McCain was Hitler. Even Mitt Romney, perhaps the most decent man in America, a bishop in his church, was Hitler, wanted to bring back slavery, kept women in binders, and was a notorious abuser of puppies. There is a big difference between dissent and hate. Dissenters will assert that the other side is wrong. Haters will assert that the other side is evil. When Democrats on a daily basis employ the vitriolic rhetoric they used against Lincoln, they are labeling Trump and his supporters evil. Unfortunately, all tactics, including violence, are appropriate when dealing with evil. In both Lincoln's and Trump's cases, Democrat civil disobedience began immediately after the election. Southern Democrat states began seceding right after Lincoln won. Immediately following Trump's win, Democrats were in the streets protesting and in some cases being violent. Most recently, several Democrat state and local governments have announced plans to "secede" by refusing to enforce certain federal laws. In response, Donald Trump has promised to withhold their federal funds. This type of standoff is exactly what led to the battle of Fort Sumter, the first battle of the Civil War. 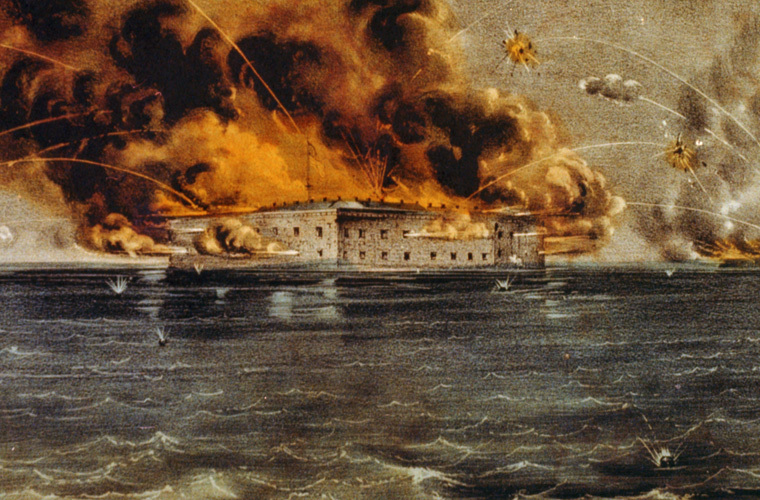 Fort Sumter took place six weeks after Lincoln took office. Donald Trump has been in office about five weeks as of this writing. If you think I'm exaggerating the danger posed by hateful rhetoric and demonization, consider that Betsy DeVos, the new Secretary of Education, vilified and threatened by Democrats and the teacher's union, has been placed under the protection of federal marshals. The only other cabinet member ever needing federal marshals was a drug czar in danger of being snuffed-out by drug cartels! Abraham Lincoln faced a similar situation from Democrat entertainers in his day. An actor named John Wilkes Booth, whom Lincoln had seen perform only a week before, was the man who infamously shot him in the head. As Booth jumped onto the theater stage immediately after shooting Lincoln he shouted, “Sic Semper Tyrannis!”, which if modernized would translate roughly to the headline above. Donald Trump has already survived at least one bumbling assassination attempt during his campaign. Dissent is a necessary part of democracy. Hatred is a necessary part of dissolution and civil war. Once Democrats convince themselves that half the country is made-up of deplorable fascist Hitler supporters, don’t they then have an obligation to eliminate them? If you are convinced that any Trump supporter you know is evil, where does that logically lead? Hateful rhetoric disguised as dissent can unintentionally paint impressionable minds into a dangerous corner with no peaceful way out. We know what that led to in the 1860s. The New York Times has finally figured-out that Donald Trump is Al Czervik, the Rodney Dangerfield character from the classic 1980 comedy, 'Caddyshack'. Welcome to the club. I've been fascinated by the Trump/Czervik congruence since Trump announced his candidacy. Both are over-the-top, ostentatious, boorish, real estate tycoon golfers who upset the establishment. And both are oddly lovable to their fans. In fact, of all the great characters in 'Caddyshack', Al Czervik is the most enduring and popular according to polls. A Ferrari is a superb automobile (…or so I’m told! ), but if you drive one off a cliff you’ll quickly find it makes a horrible airplane. Similarly, our government is designed to do a few public sector things well, but when we ask it to do private sector things it’s like asking a car to fly. That’s what happened with Obamacare. Democrats strapped some wings on a car, and then drove it off a cliff with all of us onboard. Republicans will ultimately fail if their fix is merely an improvement on that flying-car model. Instead, Republicans and Democrats should scrap the flying-car model entirely and perform a complete separation of car stuff from airplane stuff. Then they should allow the people who design and build the best cars to do their job and allow their counterparts in the airplane business to do theirs. I’m not suggesting Boeing or GM be involved in replacing Obamacare. The point is there are some things the public sector should do, and there are others the private sector should do. Healthcare, being a dynamic, complex, service-oriented market, is precisely the kind of thing governments are ill equipped to micro-manage. Like an airplane, healthcare markets are moving at breakneck speed, must be able to change course instantaneously, and are operating in turbulent three-dimensional space. Conversely, providing a safety net, which is essential in healthcare, is precisely the kind of thing the public sector must do. But like a car designed by committee, the public sector is perennially underpowered, overweight, low on fuel, and operates on a one-way dirt road that only allows direction changes every four years. Public sectors work best if they keep things simple, realistic, and have a clearly defined mission. For a long time, even preceding Obamacare, we were using the flying-car model and our designs were poor for both functions. For an airplane to fly well there must be an instantaneous response from the controls to the flight surfaces. Similarly, for free markets to function there must be an instantaneous response from buyers to sellers. In both cases a direct linkage is essential. Nothing like that has existed in healthcare for decades. Since WWII there has been a huge tax advantage for employers to provide health insurance to their employees. As a result, for the vast majority of Americans covered by private health insurance, there are two thick layers of bureaucracy between buyers (patients) and sellers (doctors, hospitals, etc.). All told about 95% of Americans get their health insurance from either government (federal, state, or local) or their employer. Obamacare has only made it worse. That leaves only about 5% of the population that actually buys their own health insurance. Unless and until health care and health insurance become consumer products, something the vast majority of Americans pay for on their own, there will never be a true functioning free market. As long as there are two levels of bureaucracy between buyers and sellers, price, quality, speed, access, and satisfaction will all suffer. The idea of direct linkage applies to cars as well. When the federal government provides a safety net there is a critical break in the linkage between buyers and sellers. The reason is, the federal government has access to what appears to be free money. Having access to the world’s reserve currency makes borrowing and printing dollars deceptively easy. Politicians can over-promise and under-fund without negative short-term consequences. This is an illusion that will inevitably backfire on our descendants. To avoid this problem states must be the safety net providers. By definition states are forced to be more realistic, more practical, and more skilled when providing safety nets. They are closer to the facts on the ground and cannot access money without repercussions. If states want to provide a high-cost safety net, they must be willing to tax their citizens a commensurate amount. That forces a discipline that the feds can too easily cheat their way around. Ronald Reagan used to say, “There are simple solutions - just not easy ones.” By that he meant that the solutions to seemingly complex government problems can often be quite simple, but implementing them is another matter in a divided government with checks and balances. · Government should not be in the business of providing healthcare or insurance, but instead must be there to provide a safety net in the form of vouchers or cash. · This should be how Medicaid, Medicare, subsidies, insurance for pre-existing conditions, etc. all should be handled. · The private sector free market should provide all healthcare and health insurance. · Thus, the private sector handles all the services and products, and the public sector provides money for the safety net. · All Individuals, whether self-sufficient or in the safety net, should be the buyers of their own healthcare and health insurance. · Tax policy should change to favor individuals over employers. · One possible tax change would be to dis-allow health insurance deductions for employers, and at the same time increase wages and lower payroll taxes by a commensurate amount to transfer the tax advantage and premium dollars to individuals. This would result in no net changes to anyone, but it would shift the market to individuals. · Individuals should be free to form groups (marathon runners, vegans, non-smokers, etc.) to help them save on premiums. · Medical providers and insurers should be free to advertise, disclose prices, and compete openly. · The government safety net should be voucher or cash based so that recipient individuals can make their own choices. · Federal taxes would plummet and state taxes would rise commensurately, but there would be a net savings in improved efficiency since states are better run overall than the federal government. · The safety nets should provide for the essential needs of the poor, the sick (pre-existing conditions), and the incompetent. · Each state should be free do what’s best for their population in terms of how they structure their safety net. (One of the issues we hear a lot about is the inability of health insurance companies to sell policies across state lines. This is because of an old law called McCarran Ferguson that exempts insurance from federal regulation and the commerce clause. As a result, insurers cannot sell across state lines, must maintain separate corporations in every state, and must answer to fifty state regulators. Without McCarran Ferguson insurance would be portable, national, and cheaper. Democrats have been dreaming of a federal government healthcare takeover for over a century. Republicans tend to prefer a free market with a safety net. That impasse is how we’ve ended-up with the worst of both worlds - the flying-car healthcare system. Democrats Have Seceded From The Union. What's Next? The election of 1860 was so traumatic for Democrats in the South that they began seceding from the union immediately afterwards. But the Civil War did not start until April, 1861, when a dispute over who controlled Fort Sumter resulted in an attack by the South. By the end of the war, 620,000 soldiers alone had died. There's a meme that's been going around since Donald Trump's election that says, "Wow, I haven't seen Democrats this upset since we freed their slaves!" At the risk of being melodramatic, I'd like to make the case that this is eerily perceptive. I've written in the past that the Civil War was really about an entitlement mentality towards slavery. The South wasn't interested in abusing Africans for the sake of abusing them. It was about economics and preserving a lucrative economic system based on the slavery entitlement. The South did not want to lose its entitlement, and the Republicans, embodied by the newly elected Abraham Lincoln, were a direct and imminent threat. Explaining secession in 1860 in terms of entitlement helps explain what is happening today with the Democrats and Donald Trump. Support of the vast majority in media, academia, and entertainment. Donald Trump is a threat to each of these Democrat entitlements. His unconventional, brash, improvisational, and ultimately successful ascension to the Presidency has gotten their attention. So they are reacting. The Democrat response has been variously called a temper tantrum, a melt-down, a fit, a resistance, a civil disobedience movement, a protest, etc. But what it really is, is secession. Unlike the South, which was a geographically distinct entity, the Democrats are spread throughout the country. This is not a physical secession like the one in 1860, but more of a philosophical one. Democrats have seceded from the Constitution of the United States. Of course they would disagree and say they are actually defending the Constitution. That's exactly what the South said in 1860. So, what's the next step? Are we headed for Fort Sumter? Today, Democrats seceded from the entire process of advice and consent in the Senate committees, something never done on this scale in the U.S. before. Interestingly, the battle of Fort Sumter happened about six weeks after Abraham Lincoln was sworn-in on March 4th, 1861. We are still less than two weeks into Donald Trump's presidency.